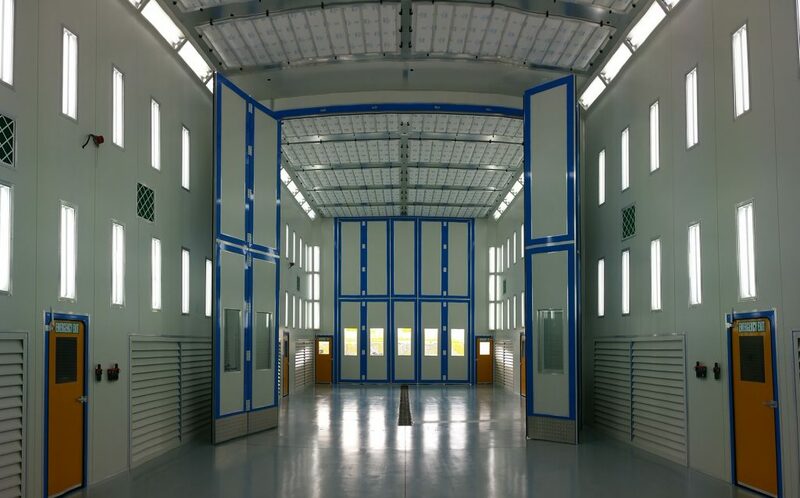 A combined facility can provide a more efficient and compact process for the preparation, painting and curing of paint when refurbishing Aerospace components. Its one thing to make a great Australian product, its another to deliver it. TRUFLOW has the skills and experience to deliver your project. An Engineered Solution for Helicopter spray painting facilities. Spray Painting a Helicopter is a time consuming process, but what would happen if you could consolidate all the processes into one station and complete all the work without having to move and change locations. Well that is exactly what this giant of a spray booth was designed and engineered to provide. It is a combination facility providing Stripping, Preparation, Painting and Drying all in one space. Further to this the once space can be split into two individually operable booths or one large booth with the central doors open. This unique design is certainly a Australian first and we believe it may be the only one of its kind in the world. This spray booth is a on floor downdraft system complete with 3 Stage NESHAP Chromate filtration, heating and baking capabilities as well as cooling and RH% temperature calibration. Stripping / Wash Mode mode: When activated reduces the airflow within the cabin to a lower airchange rate. Compressed tool air is activated as is the wash function and the spray air regulators are isolated. A 50/50 bypass engages taking air from a bypass filter high in the cabin and also driving the motorised louvres closed to 10% on the exhaust. Stopping water droplets from entering the plenum. Drying mode: Can be activated to accelerate drying between modes, it can be set to bake or simply engage heat to bring up ambient temperature to assist with drying or flash off. Spray mode: Has full airflow with down-drafting air passing over the product and through the side exit exhausts with motorised louvres now open and bypass dampers closed on the high side. Heating and Cooling is activated with RH% control to ensure the temperature range falls within the pre-set aviation specification limits. Bake mode: Bake is engaged on a batch process and can be activated in either one of the split cabins individually or as an entire booth. Airflow rates are adjusted automatically via the variable speed drives allowing inlet and exhaust to actively manage cabin pressure.